A cover work object may be associated with zero, one, or many covered work objects. Normally, the cover work object can be resolved only after each of the covered work objects becomes resolved. 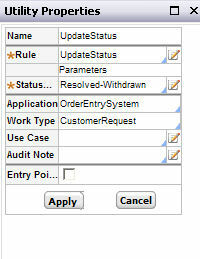 An application can resolve the cover automatically, through a ticket, when all covered work becomes resolved. Or, in other situations, a human operator can resolve the cover work object after all the covered work objects are resolved. In some business settings, an unusual situation or event affecting one of the covered objects means that the whole group – the cover and all covered work – should be immediately resolved. For example, to support a bank’s commercial loan approval processing, a restaurant chain must provide audited financial statements from each of its many subsidiary restaurant locations. 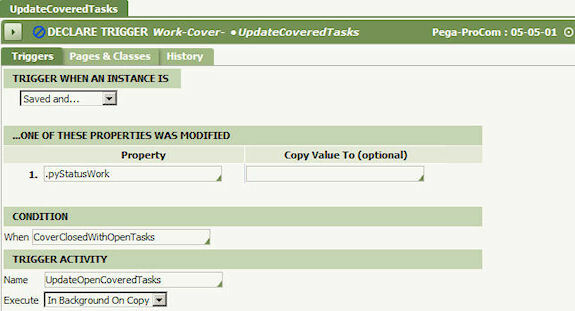 The bank’s overall processing of the loan uses a cover flow; processing for each location uses a covered work object. If evidence is found that one of the restaurants is unable to provide the needed financial documentation, the entire loan request should be withdrawn (cancelled) quickly. Prompt cancellation of all the work objects prevents anyone in the bank from spending further time and effort on a loan that will never be made. Using a single ticket to represent such an unexpected event, an application can resolve both the cover and all the covered work objects, giving each a special status (such as Resolved-Withdrawn). Follow these steps to end the flow immediately. Note: v5.5 requires Hot fix item HFix-1869. Contact your Global Customer Support representative to obtain Hot fix item HFix-1869. 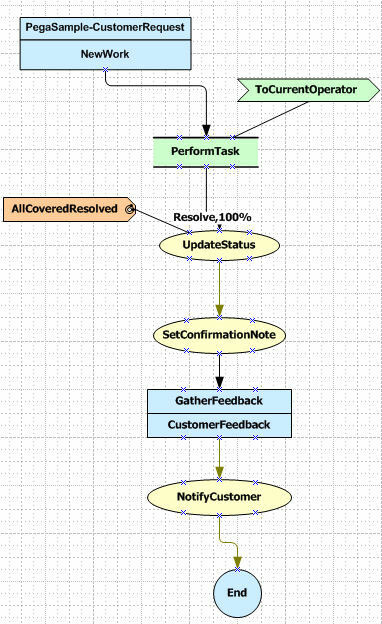 Below, the Customer Request flow supports covered objects. 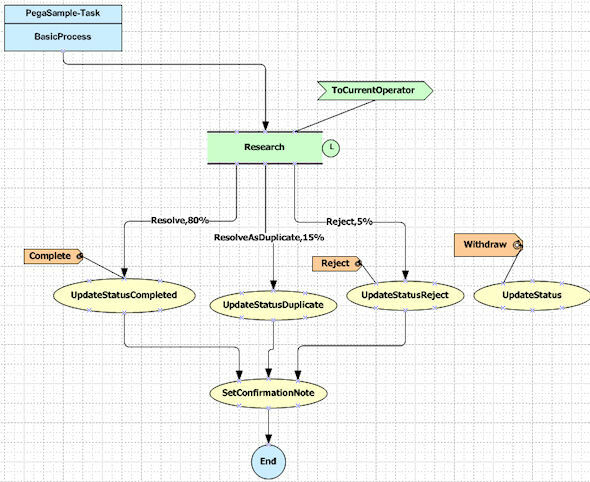 In the Utility shape, call the standard activity UpdateStatus . Set the status to Resolved-Withdrawn. The Utility shape can either have no outgoing connectors, or it can have a connector leading to the Flow-End shape. Add the Withdraw flow action to the PerformTask on the cover flow. Go to the covered flow, add a Withdraw ticket and attach to a Utility shape. Follow Steps 2-7. After saving, find the current assignment on the cover, and chose Withdraw Work Object. A standard Declare Trigger rule (Work-Cover-.UpdateCoveredTasks) goes to each covered work object and sets the Withdraw ticket, which causes them to become Resolved.